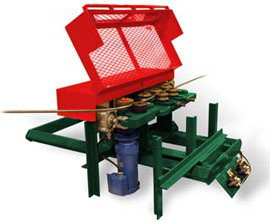 The KRB Bar Prestraightener System allows one operator to load and prestraighten bar off coil. Loading an automatic between coils can be a tricky job. The curve of the bar coming off the coil may require multiple people to pull, hold and load the coiled bar into an automatic. The Prestraightener makes it safer for one man to load the coil to the machine. The KRB Prestraightener, clamps, holds then drives and straightens coiled bar, making loading safer and easier. Spend less time between change over and get your automatic making shapes faster with the KRB Prestraightener.